Visiting the Arts Festival in State College this weekend I stumbled across this great little cupcake shop called *ndulge. 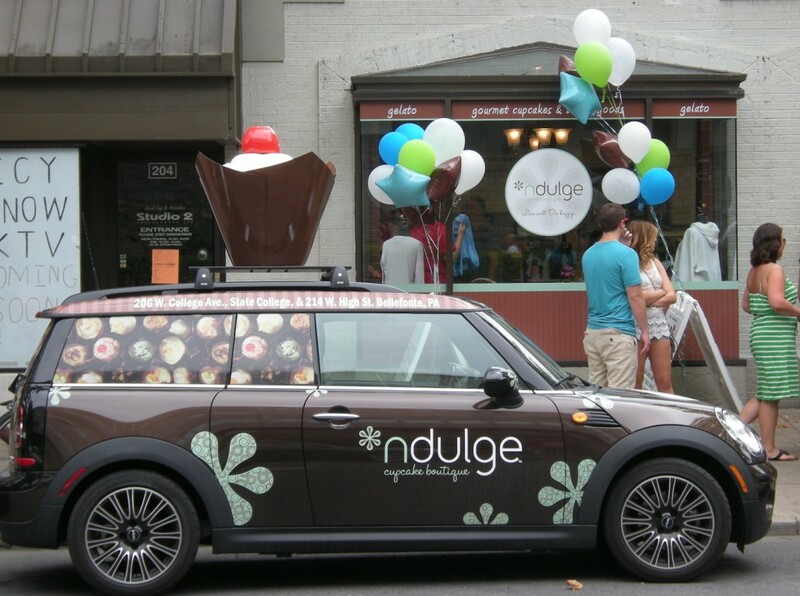 Walking along College Avenue I saw a Mini Cooper parked at a metered space with a three-foot tall cupcake on its roof and an absolutely great super graphic vinyl car wrap. Of course this was a sculptural cupcake made of sheet metal, painted with high gloss paint and topped with a giant cherry. If it weren’t for the Mini mobile billboard I might have walked right past the store not even noticing the epicurean bakery. However, the power of the branding made me take notice, the name *ndulge, the logomark, the color palette are all artfully wrapped up in a vinyl super graphic that made me not only stop and take note, but also smile at the brilliant marketing strategy. The *ndulge founders wanted a store design with baked goods that bring back the emotional connection that we all had as children walking onto our favorite bakery. They have succeeded on that score. For every national retail brand covering the landscape with sameness and predictability there are an army of small entrepreneurs with new ideas creating authentic brands. These startup companies often out maneuver the well-financed national brands and their in-house creative departments. In addition main streets throughout the country are clamoring for local, unique and authentic retailers to populate empty storefronts in their towns. Retailers like *ndulge are just the ticket, sweeeeet! Bottom Line: As with all branding their needs to be an emotional connection between the customer and the product. *ndulge’s web site states that “Life can be difficult…But a bit of indulgence here and there goes a long way to put a smile back on your face.” This statement mirrors one of my ‘brand meter’ tests which I use – if a retailer can put a smile on my face, they are starting to get my attention and I am much more likely to patronize the retailer and become a repeat customer. I am very happy to report that *ndulge gets it; however I unfortunately do not live in State College to become a repeat customer.